Learn to make your own books with mixed-media artist Dawn Livera. Using traditional and some unconventional techniques, Dawn will inspire you to explore your creativity and make each book a personal artistic statement. In 2015, Dawn spent a year making an assortment of 52 artist’s books out of papers she had lying around her house. Each one is a unique, expressive work of art. Inspired by this collection, Dawn will teach you how to make your own books by up-cycling common household items. You’ll cut, fold, glue, staple and stitch things like cardboard boxes, envelopes and junk mail to make two or three different styles of books. First, you’ll focus on construction of the book – binding it and creating/decorating the cover. Time permitting, you can also play with the inside pages: drawing, sketching, collaging, etc. on a variety of plain and patterned papers. 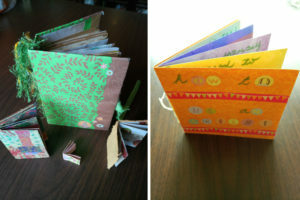 You can then use your books as journals, sketchbooks, scrapbooks, notebooks or whatever you wish! The beauty of this method is that you can go on to make more books at home using common household items so you don’t have to purchase expensive supplies. Enjoy a buffet of complimentary sweet and savory tidbits and, perhaps, purchase a glass of Burgundy to help get your creative juices flowing. Food, coffee, tea and supplies included; cash bar.